In many dog breeds, Chondrodystrophy (CDDY) and/or Chondrodysplasia (CDPA) cause a short leg phenotype. However, CDDY is associated with a high risk of premature degeneration of the invertebral discs (Hansens type I intervertebral disc disease, IVDD). CDPA is inherited in an autosomal dominant manner and especially known in short-legged breeds like Basset Hound, Pembroke Welsh Corgi, Dachshund, West Highland White Terrier and Scotch Terrier. Regarding the length of the legs, CDDY is inherited as semi dominant trait. This means that heterozygous dogs (N/CDDY) have shorter legs than dogs tested as free (N/N), while affected dogs (CDDY/CDDY) show a more drastic reduction of the leg length than heterozygous dogs (N/CDDY). The risk for IVDD is inherited in a dominant manner, therefore one copy of the variation is sufficient to predispose dogs to IVDD. 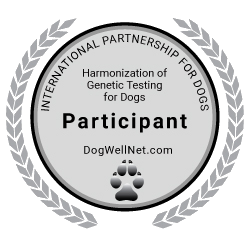 We offer the combined test for CDPA and CDDY in order to enable the prevention of CDDY and to prefer CDPA, so that the short leg phenotype could be maintained (by CDPA) while minimizing the risk for IVDD. The prevalence of the genetic variations causing CDPA and CDDY as well as the interaction between the two variations is still subject of ongoing research.